Brimming with insights and packed with information, this book draws you out, quite literally, into nature to experience a new, well thought through pattern of spiritual practice. Bruce Stanley gives you all the resources you’ll need, both practical and theoretical, to get going with a group or on your own. Download a free sample here including a foreword by Steve Hollinghurst. Bruce Stanley takes us on a highly readable journey out into nature to discover a new form of Church. Not only does the book remind us of nature’s ability to speak powerfully about God, it also serves as an effective reminder of the urgent need to bring spiritual depth to the task of caring for the earth. I’ve been lucky enough to attend Bruce’s Forest Church in Mid Wales where we found meaning in some of the simplest things we experience on a daily basis and yet seldom take time to ponder. Sharing this encounter with others was enriching and refreshing. I am privileged to support this venture. +Andrew John, Bishop of Bangor. Bruce Stanley’s easy to read, inspiring, practical book is written with his skills as a life coach and a naturalist to the fore. He takes spirituality beyond its traditional confines of building and doctrine to a new kind of church that is earthed in experience of the outside world and the One who made it. His refreshing, inclusive and enthusiastic approach is timely and will speak to today’s hunger for a church that can reach wider and touch deeper simply by starting with the ground we stand on. Tess Ward, Chaplain and author of The Celtic Wheel of the Year. 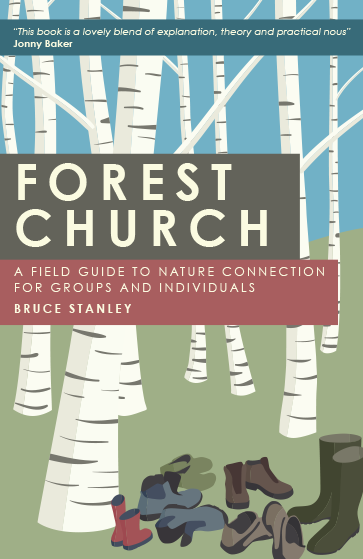 I sense that ‘Forest Church’ by Bruce Stanley will become a vital textbook for many of us who long to reconnect faith, being human and the natural world. Drawing on his own extensive experience, insights from other nature-experts and the spiritual practices of those who have never forgotten our belonging to the earth, this ‘Field Guide to Nature Connection’ engagingly offers a wealth of insights, ideas and resources to enable us to participate with nature. Time to get out into the forest! Ian Adams, author of Cave Refectory Road and Running Over Rocks. I loved the idea of Forest Church from the very first moment I heard about it and chatted with Bruce at Greenbelt. The natural world is a place where many people sense awe and wonder whether that’s looking up on a starry night or watching the ocean or wandering through a woodland. And it’s a neutral space - i.e. people don’t feel they’ve got to cross someone’s threshold to experience it. So for people interested in spirituality but not in religion that is controlled by ‘The Church’ as they perceive her, there is no threat in being in the open of nature with others. When you stop and think about it why haven’t we been doing a lot more of this?! It’s simple, low cost, creative, fun, easy to reproduce, and connects instinctively with many peoples sense of spirituality. I am sure a few people will have concerns - they always do with anything that’s new in my experience. But in terms of mission this is simply a wonderful way of connecting with and journeying with people in exploring faith from the Christ tradition. I like the challenge of wrestling with language that Bruce is embarking on too - many people are alienated by religious language so finding language that is honest about what forest church is but playful with the culture seems exciting. It’s what people have done in crossing cultures for centuries. It also strikes me as something that is instinctively a good approach for a community of a wide range of ages including young and old. The book itself is a lovely blend of explanation, theory and practical nous. It encourages local creativity but gives plenty of ideas (a whole year’s worth actually!) to get a forest church underway. I hope this helps kick start a whole load more forest churches. Jonny Baker, Course Leader CMS Pioneer Mission Leadership Team and author of Curating Worship. Don’t read this book if you’re not ready to be surprised – and quite possibly delighted. Our alienation from the natural world is well documented, and Bruce Stanley offers tried and tested ways to explore the connection, whether in urban park or remote forest – with the possibility of personal renewal and even encounters with the divine. Olive Drane is author of Spirituality to Go, Fellow of St Johns College Durham, England and Affiliate Professor at Fuller Theological Seminary, California. *If ordering in bulk or for more accurate international postage when ordering multiple products please send the full order details and your address to the contact us link above. I AM INTERESTED IN STARTING A GROUP IN MY AREA. Haven’t read the book but saw the link via the Rejesus site & love the idea of a Forest Church. I would like to join a forest church group…are there any in my area? This Forest Church sounds absolutely amazing. I feel more connected to the spiritual aspect of life outside in nature than I do inside a building. Great post! Love it! I’m also going to several meetings in a forest church close to my home.